Hello! I'm so happy to join this fine group of educators to share the love of winter reading. If you know anything about me, you know I can't talk about reading without talking about writing. In this post, I'll briefly demonstrate how to use poetry as a context for: engaging repeated readings (a new, exciting, multi-modal strategy), inspiring poetry writing, and teaching grammar. 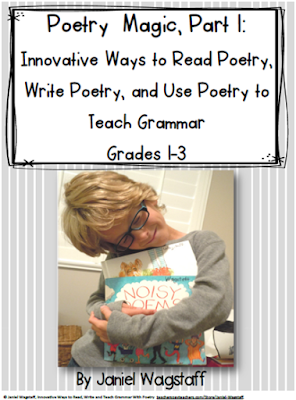 The strategies are universal and can be used with any poetry you love. 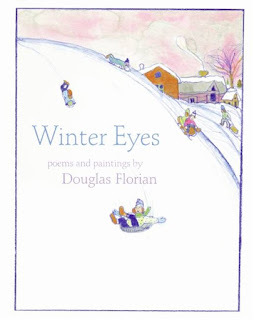 Today, I'm using Douglas Florian's Winter Eyes as a mentor text. I love Douglas Florian's poetry. Winter Eyes contains forty delightful poems covering varied winter topics students will easily relate to. For example, examine "What I Love About Winter" and contrast it with "What I Hate About Winter." Florian's amazing ability to spin a rhyme coupled with his charming watercolors will keep students' interest levels high. 'The winter sun's a grumpy guy. He scarcely gets to see the sky. What fun to read the words as they climb a hill then sail down again in Florian's painting! I've created a packet outlining how to use Florian's enchanting poems (or any poems) to accomplish the three goals mentioned above. Each strategy is explained in greater detail there, but I'll summarize below. Please note: This product will only be FREE to download for one week from today (11/27-12/4/15). First, as I'm sure you know, multiple rereadings of poetry has been proven by research to increase students' fluency. 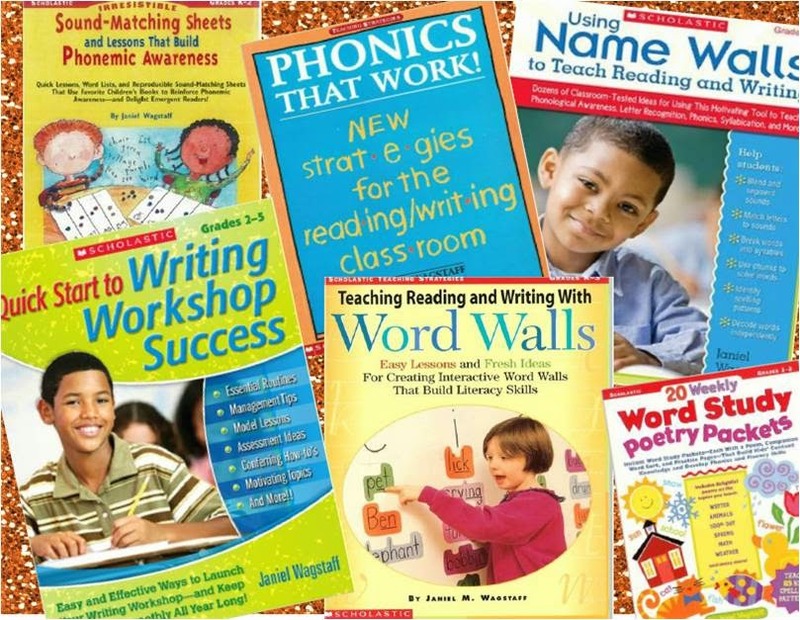 How about a new way to engage students in these rereadings? Try "Poetic Mini-Dramas:"
Students use their upper bodies, arms and hands, facial expressions, and voice to ‘act out’ a poem we’ve enjoyed through shared reading (we decide on the movements we’ll use to act out the poem together). The children receive their own copies which they put in their laps if they're seated on the floor or on their desks if seated there. The students LOVE this kinesthetic approach to rereading poetry. To get a better idea of this strategy, you can watch a 14 second video of a second grader doing a very short poetic mini-drama here! Do note the JOY on this kiddo's face! Poetic Mini-Dramas are not only great fun, but they are excellent vocabulary builders since students act out a variety of new and interesting words. 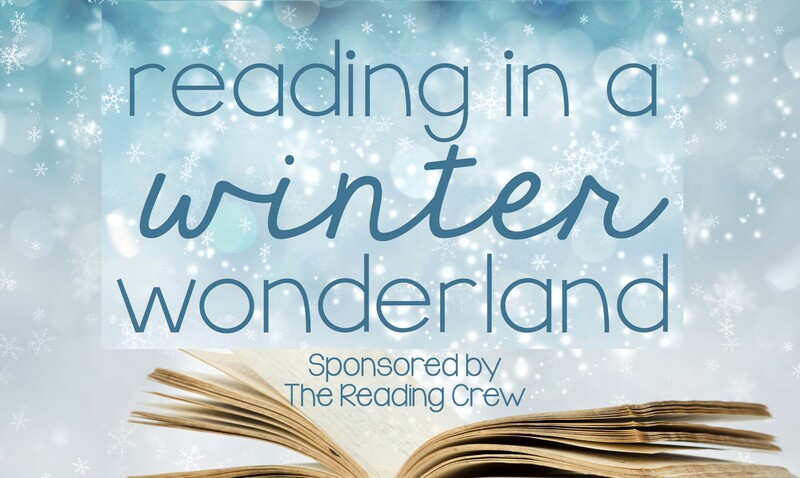 Additionally, if you have students perform a few along with reading poetry they've written, you have a simple, yet entertaining, program for families to enjoy! Second, inspire students to write their own poetry by lifting a line, a sentence (or two) or a phrase from a poem. Students simply write 'off of' this starting point. Of course, this works best if you model it several times first while thinking aloud about your process. An additional scaffold is to write several such poems together as a class. 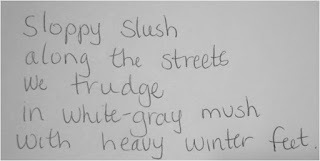 Third, teach simple grammar by engaging in a variety of sentence play using lines or phrases from poetry. You can always make up the language pieces you want students to use, rather than lifting them from a context, but I find it very meaningful and engaging for students to compare their sentences with the language the original author used in a poem. I engage my students in: sentence completion, sentence rearranging, sentence mash-ups, and sentence expansion. I model, then we take on these sentence challenges together as a class or with buddies. The work is very interactive. 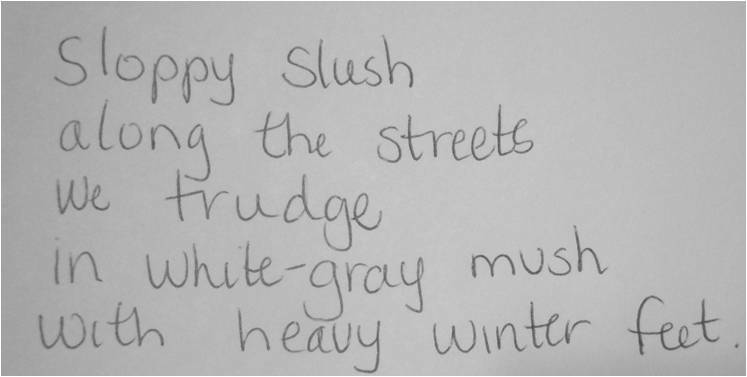 From page 24: “Freshly fallen snow _________________"
Students have a great time, AND, they're learning grammar without torture! 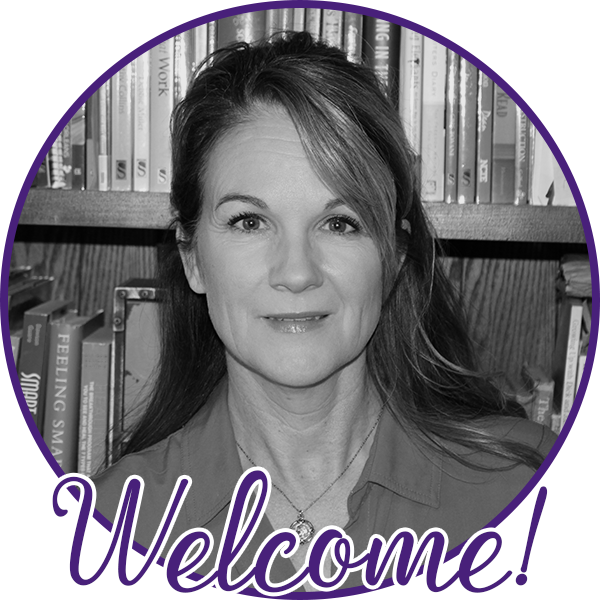 Thanks so much for linking up and sharing your great ideas! I too love using poetry in the classroom for so many purposes. I love reading and writing poetry with my students. This is a great mentor text to add to my poetry collection. Thanks for the awesome freebie full of ideas to use with this book! Hey Jonelle, This is only one book in a series of 4 he did on the seasons. They are all wonderful--picture is in the freebie! Have a happy day! Thanks for coming by! Thanks for sharing such detailed ideas and the poetry mentor text. It's nice to hear about some lesser known poets and authors in this hop! You are very welcome, Jessica! 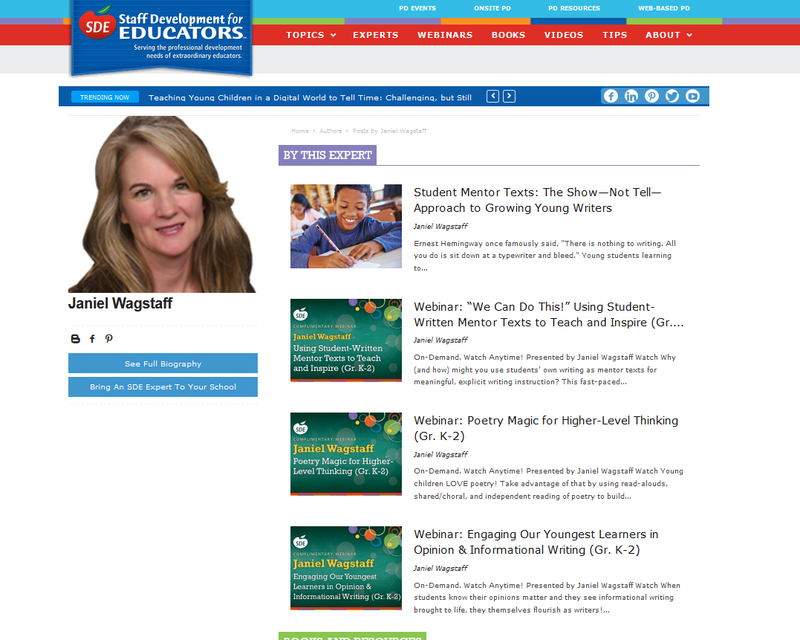 I'm excited to share the great strategies as well as the great text. Going to check yours out now! I love using poetry throughout the year in my classroom. Thanks so much for the winter poem freebies. I will have to check out this book to add to my collection. Thanks so much for your comment. I also love using poetry--so many learning opportunities in a small, engaging context!